Car Yard is an exciting racing game. This game has simple graphics, suitable for all ages, especially children and families. You can experience this game on your browser because it is a flash game. In this game you will control a car. Your task is to pass all the obstacles on the way and run to the destination safely. The game has many stages, each stage is a challenge for you. 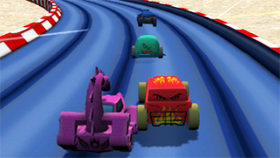 Interesting in this game is that your car will automatically run, however, when encountering the obstacles, on the screen will appear arrows. You need to choose an arrow so your car can perform an action. You need to look at the terrain and objects on the map to select the arrow. There will be an arrow that will make you lose and an arrow will help you overcome obstacles. Besides, whenever you go through an obstacle, the game will automatically be saved.